If you had the opportunity to travel back to the beginning of this decade and tell your peers that The [email protected] franchise would become synonymous with outstanding anime productions, roaring laughter is about the best response you could expect. 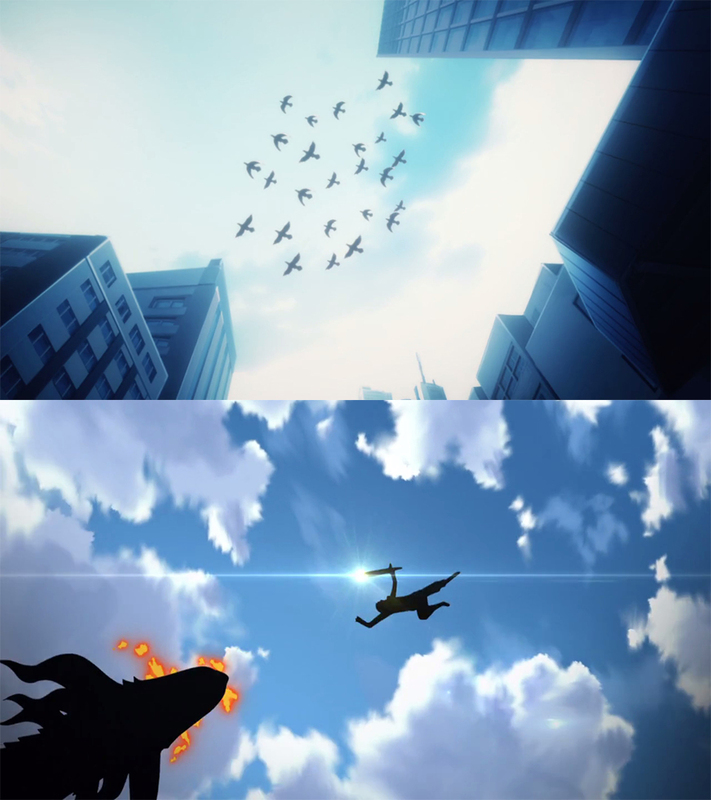 Seven years later though, and that claim has become an undeniable fact: the peerless duo of Gainax star Atsushi Nishigori and former coach of a soon to be KyoAni behemoth Noriko Takao decimated all expectations for the original adaptation back in 2011, after which the latter teamed up with Yuusuke “Fugo” Matsuo – a figure who’s inspired a significant amount of the industry’s current rising stars – to handle Cinderella Girls. Talent and ability were a crucial factor towards these results, but that wasn’t all it came down to. Overflowing passion was the secret ingredient for the perfect recipe, one that was sprinkled in not only by Nishigori himself, but a majority of the staff who had come together to work on a franchise they held dear to their hearts. Passion so strong they were able to win over Takao, who knew very little about the franchise at the time, to the point where she once claimed that the original cast were all her daughters. Don’t let the past tense fool you into thinking this is no longer the case, though. 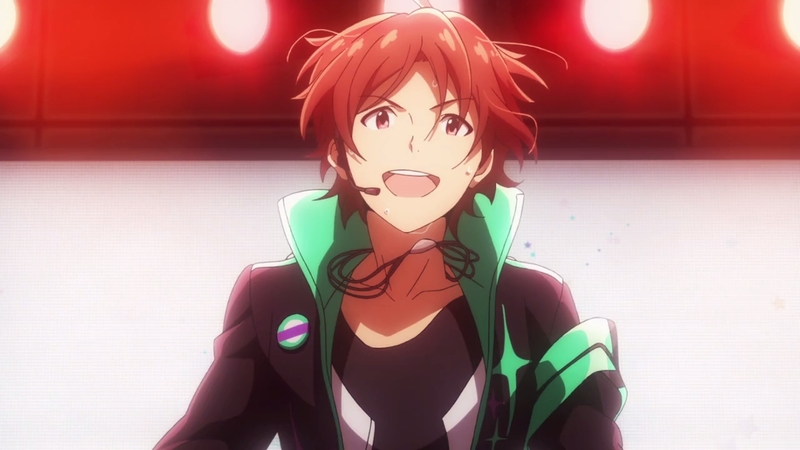 That very same passion plays a key role in SideM, both within the show and out, and no one encompasses its current form more than series director Miyuki Kuroki herself. Her involvement with imas stems all the way back to the original 2011 series, where she’d recently been promoted from drawing in-betweens to key animation. 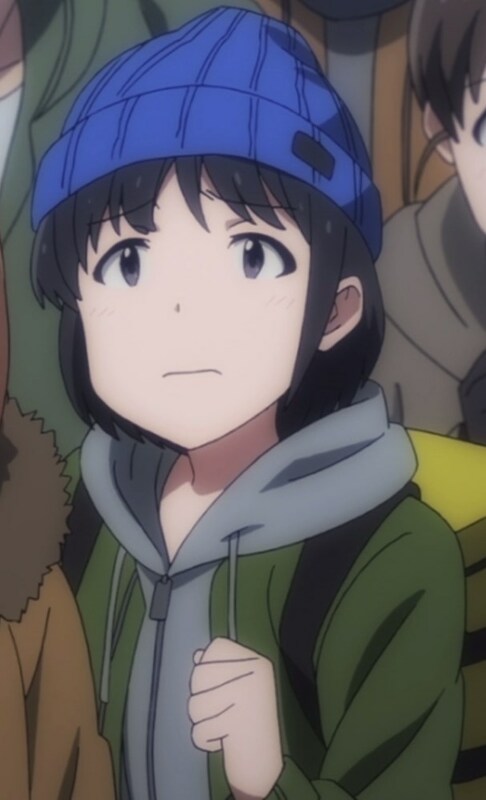 She retained this role during the first half of Cinderella Girls, and also found herself with the opportunity to handle episode direction during its second cours. Unfortunately she was never able to do too much hands-on work with the series beyond that at the time, but she clearly left a strong impression on the producers at the studio. Before that she had only directed a number of episodes of Your Lie in April, being in full control of one for the first time with #16. More recently, she shifted over to help Mamoru Kanbe (who just so happened to storyboard this episode!) on The Perfect Insider for a couple of episodes. Her next big step, serving as assistant director on last year’s Occultic;Nine, was a sign of her being propped up for something major despite not having much experience whatsoever. 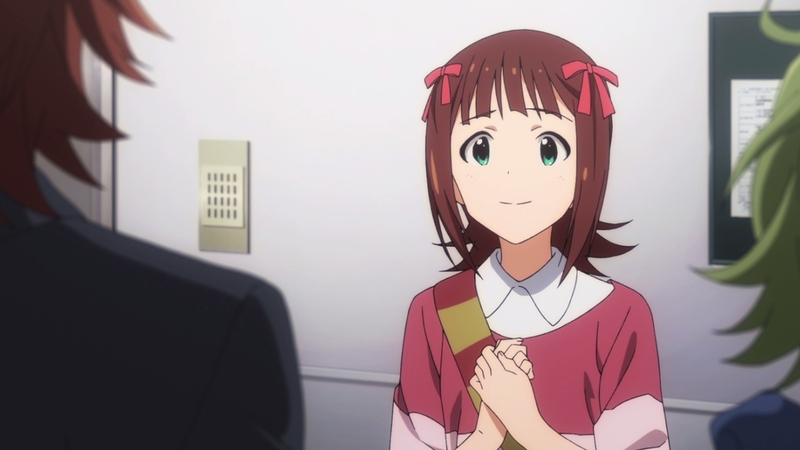 And at the same time, it was also a sweet gesture as it provided her the opportunity to show the incredible people she was surrounded by in her imas days just how far she’d come, since the majority of them had gathered together once more to work on that show. All things considered she’s still quite inexperienced, but her career is already one worth investing in, even more so now that she’s reached this stage. The passion remains as important as the talent, of course; she’s made her love of Jupiter very clear over the years, making sure to draw them at every opportunity she could. 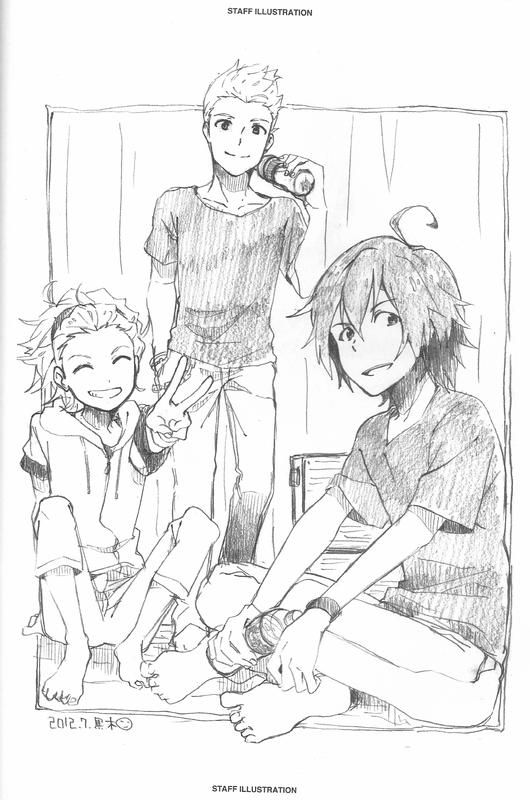 Not just in the show itself, but even in official material such as the Animas OGI☆STAR Memories fanbook and the image board created by the staff to support 765Pro’s real life counterparts during the 7th anniversary live that followed the TV series. 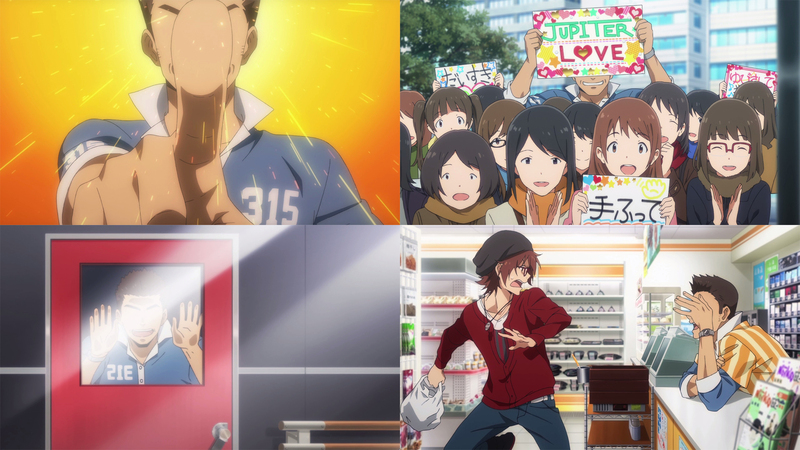 This love has clearly spilled over to the rest of SideM‘s cast, and that together with the potential that’s showcased is why (as confirmed in an interview posted up following this episode’s broadcast) her vision for the show has been given full priority, while co-director Takahiro Harada is tasked with using his years of experience to ensure the production itself proceeds smoothly. While staff introductions are important, I’ve probably leaped right over this week’s quota already. There’ll be plenty of opportunities to focus on everyone over the coming weeks though, so instead, it’s about time we dive into the actual episode. Which kicks off in outstanding fashion, no less! 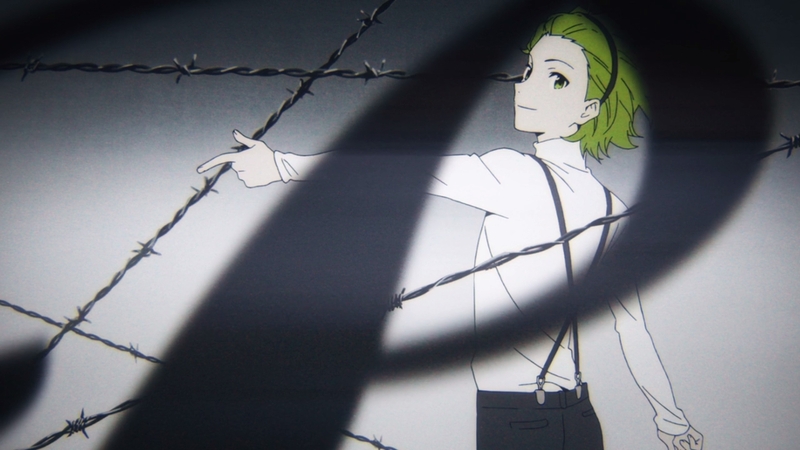 Kuroki’s ED for Occultic;Nine took heavy inspiration from the work of none other than Masashi Ishihama, and that influence remains strong during the MV portion of Alice or Guilty. Greyscale contrasting with bright accents, the striking framing, even familiar shadows! It’s not outright mimicking his work of course, but that’s for the best. I’m much more interested in seeing how she adapts those influences into her own personal style as time goes on rather than stopping at mere imitation. No steam is lost following the transition to the live performance, either. It’s not nearly as wild as what we’ve seen in the series before, mainly by nature of them taking the scale of the venue into consideration. Their capability for movement is limited in a small live house like this, so instead the focus was on how they could capture the audience despite that limitation. Megumi Kouno in particular – who I wasn’t expecting to turn up so fast until her name was confirmed in the pre-screening – pulled this off about as well as you’d imagine through her detailed drawings and ability to portray sharp movement. 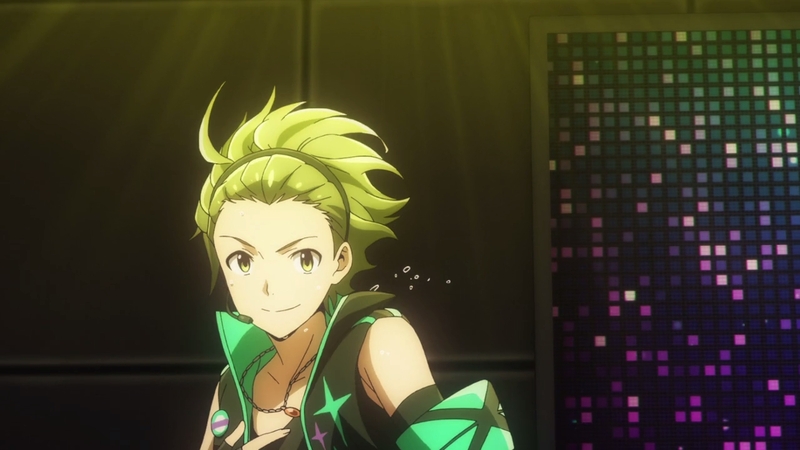 Fans with a keen eye even noticed that Shouta’s timing for a part of the dance is slightly quicker than Touma and Hokuto’s, but not because they thought it was a mistake. They recognised that this was by part of the staff’s effort to reproduce not only the original performance from imas 2, but his quirk that was present within it too. 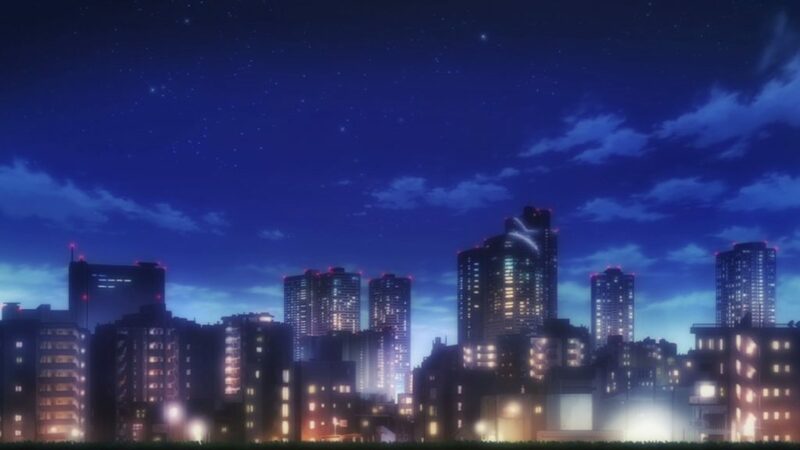 Details like this could easily be skipped and no one would bat an eyelid, but the care put into carefully capturing elements from the imas universe for its adaptations while maintaining their own identity has been a standard passed on through the years ever since Animas. The majority of the episode from here on focuses on Jupiter’s eventual transition into 315 Production as they battle with the consequences of trying to do things on their own. Kanbe’s storyboard takes over for a good chunk of it, which means there’s…not too much to say, in all honesty. 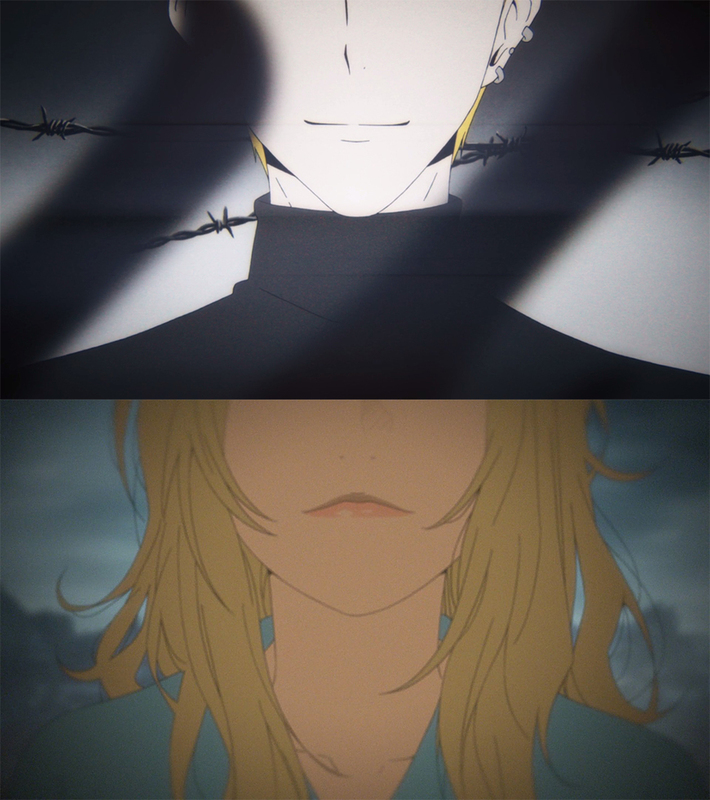 The silver lining here is that a functional Kanbe storyboard is much preferred to the jarring experiences he put viewers through on his Occultic;Nine episodes, and I’d be lying if I said it was entirely forgettable when he clearly had some fun playing about with methods to conceal Saito’s face. Kanbe’s made some truly memorable anime over his long career, but when it comes to his modern storyboard assistance, that’s essentially as good as it gets. And truth to be told, I’d also be lying if I said that I even cared during my initial watch, because all the connections to Animas in correlation with Jupiter’s own struggles were simply too overwhelming. 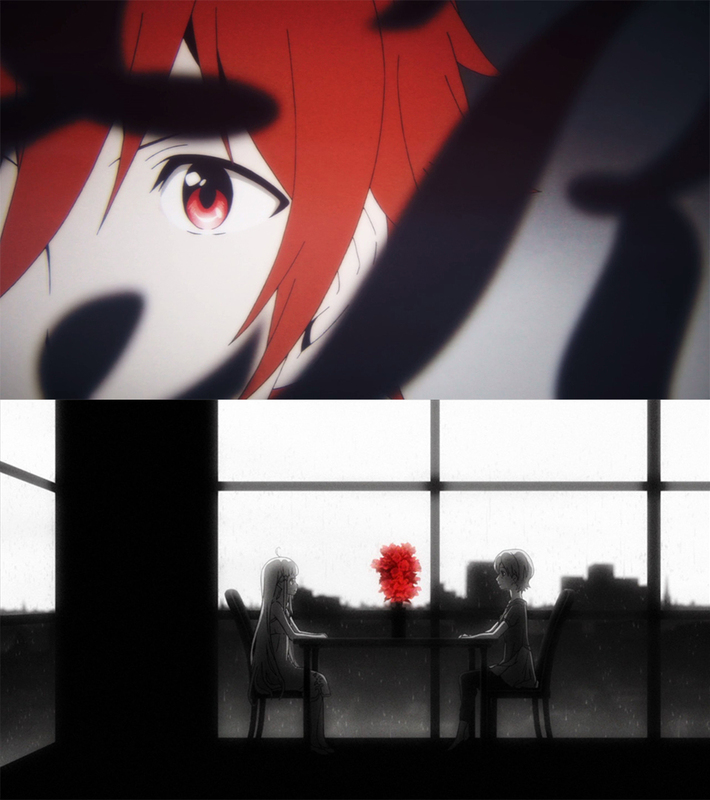 Subtle details like Haruka’s Conflict – one of my favourite tracks from its soundtrack that represented its final arc – playing as Touma found himself at a loss over what to do were bad enough as is, but outright featuring Haruka herself in a reproduction of a minor scene from the movie, giving it an entirely new meaning as we come to learn that both parties were dealing with their own issues at the time, left me unable to process regular thoughts for some time. Call it unfair if you like, but this episode is made much more powerful by its context. As a fan, it’s impossible to dissociate it from the franchise. If there’s anything that helped me recover from this close to vegetative state, it was the final performance of the episode. 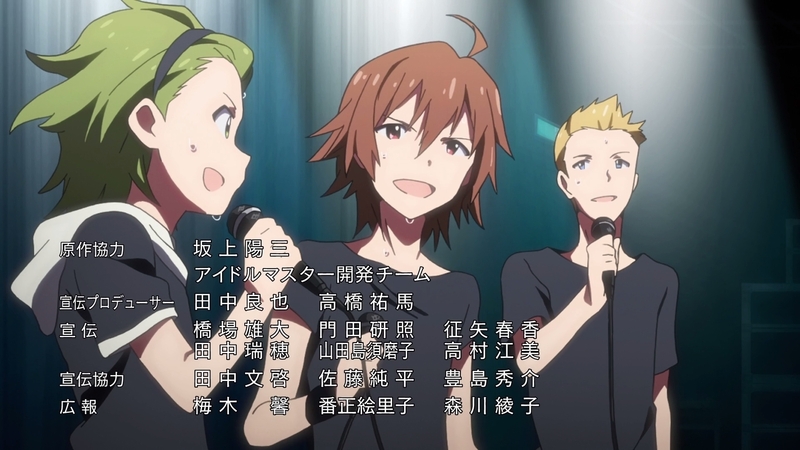 Hideki Nagamachi‘s direction and storyboarding proves that he understands the fundamentals of how to make imas performances exciting, and he was lucky enough to be supported by talented animators such as Moeka Kuga. Again though, I’d rather avoid information overload, so let’s take a closer look at those animators at a more ideal time. Instead, let’s get the negative point out the way first: the CG cuts are awkward, but at the same time they’re so minor that any claims that imas has lost its magical 2D performances are overblown. I doubt it’s the last we’ll see of them, but I’m willing to overlook their presence so long as they maintain the current status quo. The first thing that stood out for me was the dynamic camera movement despite the lack of Isao Hayashi, veritable master of the fly-by camera; a sign that his output left an imprint on the series that remains even after his possible departure. More interesting is how this is applied in relation to the point made earlier regarding the smaller venue. The staging and movement itself is more compact, as the focus is more on displaying the harmony between them while putting each individual in the spotlight, as opposed to showing off the scale of the venue and the performers’ use of that space like some massive imas performances have done in the past. Hopefully we’ll see more evolutions of established practices like this throughout the show! There’s a surprising amount of detail in the drawings through the performance as well, and you can clearly see the movement of both the fabric and objects like Touma’s necklace, not to mention other little details such as the sweat flying off them during certain movements. Let’s close this out by returning to an earlier point: passion. It didn’t take long to notice that the Brand New Field performance was an almost perfect replica of the same performance by Jupiter’s real life counterparts during SideM’s 1st anniversary live two years ago. 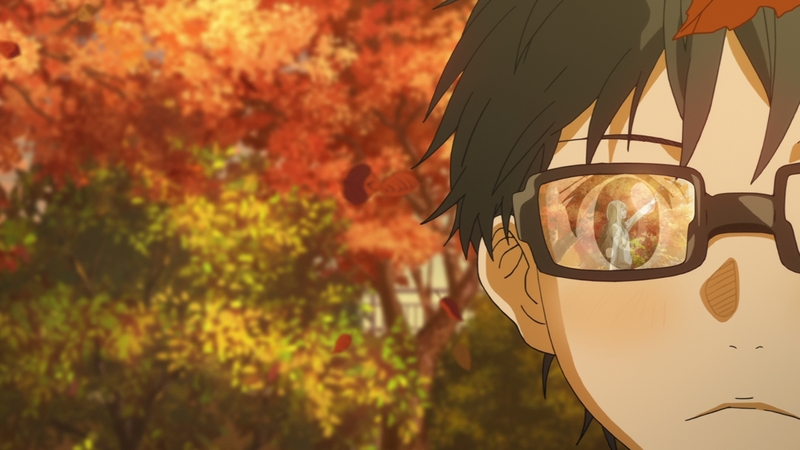 Nagamachi – while livetweeting the episode as it aired because he’s just that cute – was quick to mention that he was so moved while watching it that his take was made with the desire to have the viewers experience those same emotions he did. It’s become commonplace for the real life performances of songs created for the adaptations to share choreography with their anime counterparts, but seeing the reverse happen here brought a big smile to my face. It’s always exciting seeing the new material they have up their sleeves, but I can’t say I’m opposed to them indulging in their own love for what currently exists. Especially if it eventually leads to an anime version of Study Equals Magic! That ended up far longer than expected! Needless to say that I’m excited to have imas back, especially when SideM‘s being accompanied by Cinderella Girls Theatre. Speaking of Cinderella Girls, seeing Matsuda Risae (twin sister of Hoshi Syoko’s voice actor Matsuda Satsumi) appear as one of the mob characters upset they couldn’t see Jupiter was sweet. Enough rambling from me, though. See you next week! Thanks for this. I got so riled reading other reviews that I went to rewatch 2nd live to calm down haha. The funny thing about the Brand New Field scene is that when I first saw it I didn’t really notice the CG until jpn P’s pointed it out. 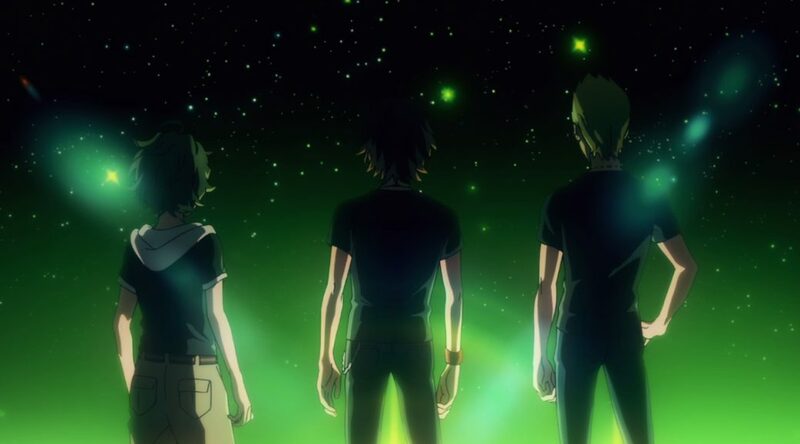 Plus they didn’t use it on Jupiter’s front only from far away (which accentuates the penlights) and from behind. And the blend from 3D to 2D was done well. I can probably deal with it if it is used like this throughout the show but only time will tell that. I noticed it right away since the models are a bit janky (they turn up as silhouettes during the Alice or Guilty MV as well), but yeah, so long as its use remains minor then I’m not going to complain. Speaking of penlights, I laughed at how they just decided to have all the fans and Saito himself balrog them instead of sticking to one or two. I heard the cries of “oh no CG in idolmaster performances, the world is over” before watching the episode and was pleasantly surprised by how it turned out to be…kinda nothing really, basically just camera movement (most of which is 2D!) in an otherwise polished performance. Less prominent than in the [email protected] concert for sure. Do NOT eat the hair of idols under any circumstances. I didn’t know Miyuki Kuroki was responsible for both episode direction and the storyboards for episode 16 of Your Lie in April! That was one of my favourite episodes in my favourite anime! I look forward to what she’ll bring to Side M, especially considering that her style of storyboarding is influenced by Ishihama! My apprehension toward this anime decreased significantly after watching this episode, and now it’s pretty much all gone!